Ted Kooser will give his first reading at the Library of Congress today as the U.S. poet laureate. Photo by UNL Publications and Photography. 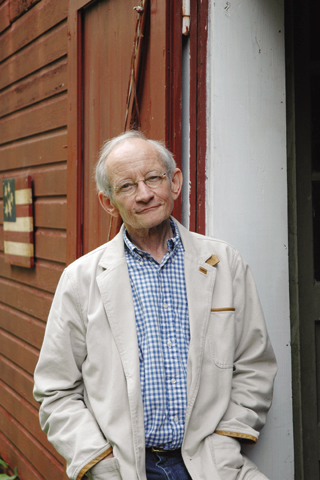 Ted Kooser, the newly appointed poet laureate consultant to Congress, will conduct his first reading at the Library of Congress on Oct. 7. Kooser's evening reading will be his first at the Library and will open its annual fall literary series. The hiring this year of two computer scientists boosted UNL's strength in computer science, especially in the arena of software dependability. They are familiar to anyone who's watched a weather report in the spring or summer: those big angry gashes of yellow, red and orange with trailing green, slashing from the southwest to the northeast, often across several states, filling the TV screen with thunderstorm warnings. Since 1974, UNL has offered University Studies, a degree program that allows students whose career or educational goals cannot be achieved through traditional majors and minors to create an individualized program. Leon Wieseltier, a literary editor of the New Republic since 1983, will speak Oct. 12 in the E.N. Thompson Forum on World Issues and the Kripke Lecture Series. The Pulitzer Prize and Tony Award-winning musical Rent is coming to the Lied Center for Performing Arts at 7:30 p.m. Oct. 13 and 14. The UNL College Republicans, UNL Young Democrats and the Mary Riepma Ross Media Arts Center will co-sponsor a live, free screening of the second presidential debate at the Mary Riepma Ross Media Arts Center. The debate begins at 8 p.m. Oct. 8 and will be followed by a panel discussion on the issues raised by the candidates. UNL professors Gerry Harbison and Bill Avery will participate on the panel, and the audience will be invited to participate in the discussion. The public is invited to a sneak preview of Willa Cather - The Road is All, the Nebraska ETV Network co-production to be aired in spring 2005 as part of the PBS series "American Masters." This biography of Cather will be shown at 2 and 7 p.m. Oct. 16 at the Red Cloud Opera House in Red Cloud at 413 N. Webster St.
Illustrations of native trees, grasses and perennials are being solicited for a botanical print competition sponsored by the Nebraska Statewide Arboretum. The winning illustration will be used to create the arboretum's 2005 botanical print. The UNL Symphony Orchestra will perform at 7:30 p.m. Oct. 8 in Kimball Recital Hall. The Stanislavsky Opera Company of Moscow will present the classic opera Tosca at 7:30 p.m. Oct. 9 at the Lied Center. Tosca, composed by Giacomo Puccini, is a psychological drama of jealousy, deceit and betrayal telling the story of Cavaradossi, his lover, Tosca, and his friend, Angelotti. The UNL School of Music will present the 2004 Nebraska String Festival Oct. 8-10. High school orchestra musicians from across the Midwest apply and participate.